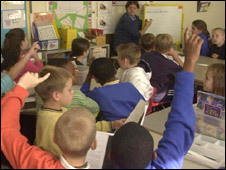 Long school holidays in England should be cut to prevent children falling behind in class, a report has said. The Institute for Public Policy Research said studies suggested pupils' reading and maths abilities regressed because the summer break was too long. Instead, the think-tank said the school year could have five eight-week terms, with a month off in the summer and two weeks between the rest of the terms. The report said the change could benefit pupils, parents and teachers. The IPPR's suggestion comes after schools watchdog Ofsted warned that a long-term rise in education standards appeared to have "stalled". Report author Sonia Sodha said: "There have been many positive gains in education over the last decade, but in recent years results have plateaued. "If we are serious about continuing to improve outcomes for all children, we need long-term reform that better gears our school system around the needs of children and young people." Ms Sodha told BBC Radio 5 Live that the current structure of the school year was a relic from the time when children were needed to help out on family farms during the summer fruit-picking season. She said there were two strong arguments for making a change. "The first is that children regress with respect to their academic skills. Their reading and maths skills tend to decline when they're away from school and this is particularly true for children from poorer backgrounds. "And that actually brings us on to the second reason. Not all children have the same access to out of school activities during the summer holidays and kids from more advantaged backgrounds are the ones who are most likely to get to go to these activities. "That's reflected in statistics on anti-social behaviour and youth offending, and we know that those levels are higher during the summer holiday, particularly towards the end." The IPPR suggested the summer holiday should run from mid-July to mid-August, followed by two eight-week terms before Christmas. Ms Sodha said that towards the end of the current 16-week autumn term both children and teachers "get worn out". After Christmas, the school year would be split into three eight-week terms, each separated by two weeks off. "We're saying that there should be the same amount of holiday, it should just be more evenly spaced throughout the year," Ms Sodha said. The IPPR said the change could help parents who find it difficult to keep children occupied during the six-week summer break. It would also provide opportunities to take holidays at different times of year, potentially saving money by avoiding peak periods. Children's Minister Kevin Brennan said it was up to local authorities to organise the term structure in their area, although the government encouraged them to use the "standard school year". The report also urged a new primary school curriculum to give children more chance to learn though play. Ms Sodha added: "Children's well-being is fundamental to their learning. "Improving results can't just be about focussing on maths, English and science. "Schools need more support in developing healthy and happy young people." She said in countries such as Finland there was "more of an emphasis on well-being as the key to improving outcomes, with school counsellors and welfare teams for all schools".